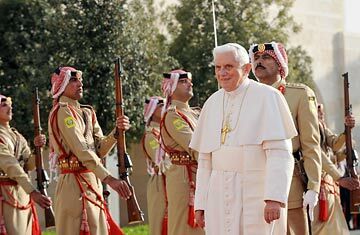 Pope Benedict XVI arrives at the royal palace in Amman, Jordan. Under Pope Benedict XVI's reign, the Vatican dossier on Islam could be entitled: "Regensburg, and Everything After." Regensburg was the professor Pope's landmark 2006 discourse at his former university that included a nasty historical citation about the prophet Mohammed and provocatively asked if Islam lacks reason, making it inherently prone to violence. The worldwide protests among Muslims, including a handful of church burnings and the killing of a nun, forced the Pope to quickly change his approach, and soften his tone. "Religion," he said at an earlier discourse Saturday, "can be corrupted .... when pressed into the service of ignorance or prejudice, contempt, violence and abuse." He called for a "mature belief in God." The speech at the mosque intertwined theology and a more nuanced view of current events than the purely philosophical discourse in 2006. "Often it is the ideological manipulation of religion, sometimes for political ends, that is the real catalyst for tension and division and at times even violence in society." Jordan is the ideal setting to return to these sensitive themes, home to the royal Hashemite lineage that traces back to Mohammed, and a modern tradition of religious tolerance. This was also where a group of Islamic scholars from around the world first launched a response to Regensburg, which led to the creation of an official Muslim-Catholic dialogue that kicked off with a summit at the Vatican in November on the religions' shared principles of love of God and love of neighbor. Speaking before the Pope on Saturday, Prince Ghaszi Bin Muhammad Bin Talal, the top religious advisor to the Jordanian King, thanked Benedict for having expressed regret for "the hurt caused by the [Regensburg] lecture to Muslims" and for other words and gestures since. Still, Ghaszi pointedly condemned "distorted depictions" in the West of the roots of Islam as "responsible for much historical and cultural tension between Christians and Muslims." He said it was now clear that the Pope's comments about the prophet in 2006 was just "a citation in an academic lecture," but added that it is incumbent on Muslims to explain the Prophets' example above all with deeds of virtue, charity, piety and goodwill." Vatican spokesman Father Federico Lombardi was asked afterwards whether the Pope's view on Islam has changed since Regensburg. "It's a journey, there's progress," he said. "We have to learn from what the Muslims tell us about Islam." This Pope has sought to infuse "frankness" in the inter-faith dialogue that was a cornerstone of John Paul II's papacy. But talking about both what unites and divides different religious traditions, requires not only talking frankly but listening carefully.